In recent years, there has been a quantum leap in commercially available terrain for wargaming. One of the biggest areas of growth has been in terrain mats. 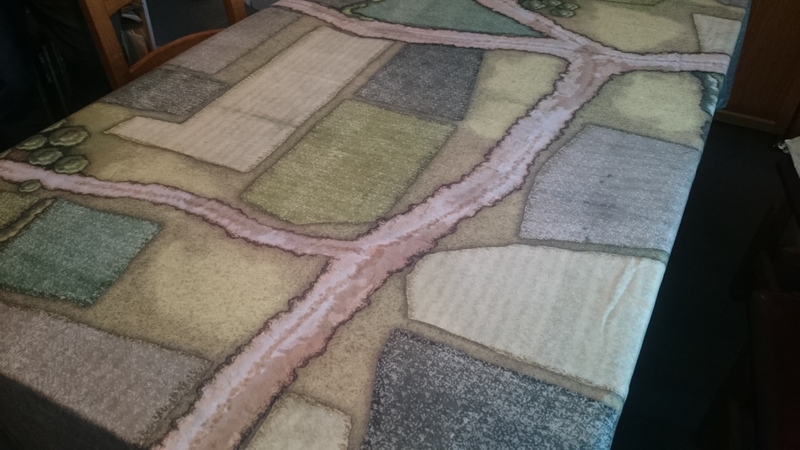 It doesn’t seem that long ago that, unless you made a table yourself, your choice of terrain mat was limited to a single colour piece of felt cloth – usually in brown, green, blue or black – and if you were very lucky, you potentially had the option of having hexes printed on it. However, we now see a large and growing selection of printed terrain mats available on various different materials; vinyl, cloth and even neoprene (that’s the stuff they make mouse mats out of). One of these new companies is Cigar Box Battle. We were recently contacted by the guys at Cigar Box and asked if we wanted to review some of their mats – to be honest, we jumped at the chance. I’ve seen Cigar Box products around for a while, North Star import them in the UK, and whilst they look very nice, I have shied away from buying one sight unseen as they are at the expensive end of the terrain mat market: a 6′ x 4′ mat will set you back £65 + postage ($69 direct from Cigar Box) – so they are potentially very costly if you don’t happen to like the product. Cigar Box Battles is a company based in Nashville, Tennessee in the United States, and is run by Cory Ring and Chris Ward. They started the company in 2014, with a goal of letting wargamers game on tables that were beautiful to look at, but also easy to store and transport (no poster tubes!) This would this enable gamers to easily change the terrain over which they fought, rather than being stuck with a single gaming table. In addition, they wanted gamers to be able to place hills and other undulating terrain under the mat, thus making the final table look more realistic – this meant that the mats had to be produced in a material which was both flexible and heavy enough to drape pleasingly over whatever gamers placed underneath it. The first is the Europe Gaming Mat #102. This is available in two different scales: 25-28mm and 10-15mm, which essentially changes the size of the roads and trees. I believe this mat is the 25-28mm version. The mat is illustrated with roads, trees and fields, which can be used as 2D terrain, or as a guide for placement of 3D terrain features. Cigar Box produce several mats in this style, some with just roads added, others with various terrain features such as fields and trees also illustrated. For me, adding these features limits the use of these type of mats as you playing over the same battlefield time and again. I can understand when this is used for specific battles (see later) but not so much for more generic scenarios. That said, you can easily overlay the illustrated terrain with other scenery, so the option is available if your scenery cupboard has limited content, or is indeed non-existent. 15mm scale vehicles are shown on this mat to give a sense of scale. These mats are beautifully made. The material is described as a durable fleece fabric. Whereas some companies use cloth that is similar to a cotton bed sheet, this feels more like a blanket or throw. What is more, each mat is lined, which helps to give the fabric added weight when draped over objects to create undulations. They produce a number of ‘generic’ battlefield mats, which to my mind are much more useful and versatile. This one is Winter Scrubland #191, which they recommend for such things as Battle of the Bulge, French Indian War or as the surface of an alien planet. In short, it looks gorgeous. The colours and textures flow really well into each other, producing a mat that is beautiful to look at. Another mat that is, on the whole, really well textured and blended. I have to say that this particular mat does have, in my opinion, something of a blemish on it. In the one corner of the mat is a dark area. It looks like this has been painted to represent a large hill or dune, and is thus darker. However, whilst pretty much every other change of texture is blended and feathered, this is a harsh, abrupt line. I mention it because it is in stark contrast with the rest of the mat, and whilst it is intentional (I did query this with Cigar Box) to my mind it just looks wrong, and spoils what is otherwise another lovely mat. It’s not a huge problem, as it can easily be concealed by placing terrain on top of it, but I simply found it a little strange, considering the quality of the artwork on the rest of this particular mat. Other than generic mats, Cigar Box also produce a range of mats which are based on specific battlefields. These include several which are officially licensed by Osprey Publishing for use with their ACW Across a Deadly Field rules. The sample we were sent is like this, but this one is of Waterloo #180, and is scaled so that the entire battlefield is encompassed on a 6′ x 4′ tabletop. It’s actually been designed to be compatible with the card units for ‘Blucher’ by Sam Mustafa. You can see on the table that there are areas for all the fortified farms and villages such as Hougemont, Le Haye Sainte and Placenoit. We placed several 6mm units on the table – each of these is on a 60mm x 30mm base – to give some sense of the scale of the illustrated terrain. Whilst these mats are obviously more limited in scope (though again, there is nothing to stop you changing the layout by overlaying terrain on the printed map) it does provide a great base for playing specific battles – ideal if, for example, you wanted to put on a game at several shows. I said near the start of this post that I had been reluctant to pay what appeared to be a premium price for these mats, sight unseen. Having now seen a selection of what they have to offer, I would say that they are worth every penny. The artwork on the mats looks great, although the terrain features have their own illustration style which may not be to everyone’s taste. However, the quality and workmanship on the mats is simply top notch, and the final product looks and feels luxurious – one could imagine a wargamer snuggling down to sleep using a Waterloo mat as a blanket, should they be so inclined! So, whilst Cigar Box Battles Mats are at the high end of the scale when it comes to terrain mats pricing, it is with good reason, as you are purchasing a very high quality product. In this instance, it really is a case of you get what you pay for. As I said earlier, my overall reaction to these mats was simple – they are a stunning piece of work, and I would highly recommend them.